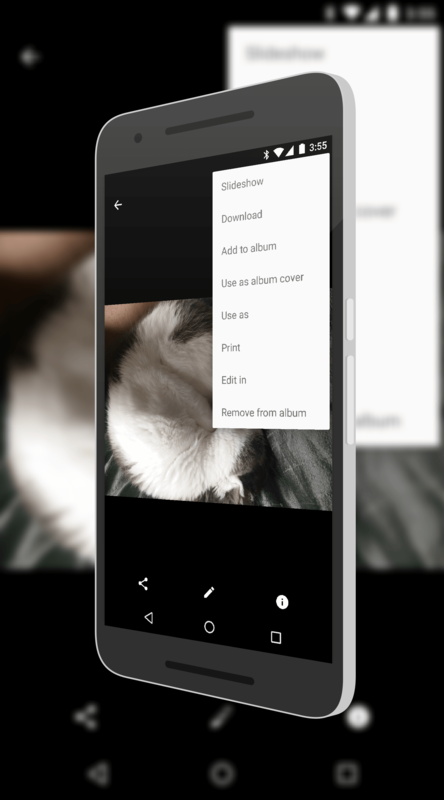 The Google Photos app and service got a small tweak yesterday behind-the-scenes that will make heavy users of the app rejoice. Now when you are viewing your albums in either the app or on the web, there is a new Slideshow feature on the overflow menu. That feature allows you to start a slide show on your devices or, if you have a Chromecast, cast them to your TV. It is a small addition but an important one as it is an often requested feature. Full disclosure: I’m a Google Top Contributor for Google Photos in the Product Forums. The nice thing about this update is there is not app update required. The most current version of the app on your phone or tablet will simply have the feature pushed to it. Once it does hit your phone, starting a slideshow is pretty easy. Just go to an album you have created then tap on the first photo (or the photo you want to start the slideshow with in the album). Now go to the Overflow menu (the 3 vertical dot menu in the upper right corner) and select the first option, slideshow. That will start the slideshow on your device. The photos will then automatically advance for you every 5 seconds so you can enjoy them without having to touch your phone. On the Photos website, the feature works the same way and is enabled through the same menu. If you want to Cast your slideshow to your TV, be sure that you have connected your device to your Chromecast prior to starting the slideshow. It is a great new addition to the Photos app and site. Enjoy!